If you found yourself in south Somerset on a sunny Sunday 13 June, you would have been spoilt for choice for things to do; from the Open Farm Sunday organised by LEAF, to a host of small village fetes alongside the bigger affairs, one of which was the Somerset Green Scythe Fair held in the fields of Thorny Lakes, Muchelney. It was the latter that we visited and never having been before, went with an open mind although to be more accurate, perhaps our expectations were a little more cynical given the history of the event and our limited interest in grass cutting. Our first concern was the distinct lack of signs, or to be more accurate, no signs at all. But we eventually found Thorny Lakes. The field park was already quite full. There was some evidence of scything in the adjacent field, but it all looked a little haphazard. Perhaps our cynicism was well placed after all. The first sight to meet our eyes was a traditional gypsy caravan with large cart horse tethered nearby. I’m not convinced the crude camp fire was actually being used to cook anything, there was a very blackened kettle hanging from a makeshift tripod over some smouldering ashes and the rusty heavy metal chain around the horse’s neck seemed a little cruel, but then I’ve only been ‘down south’ for five years so it’s still all new to me. Anyhow, I digress: the Fair. The first stall was a very tatty second hand bric-a-brac stall (not a good sign) but as we progressed things started to improve with the local scout’s tea and cake stall (the first sugar fix for impatient children sorted!). However as we turned the corner into the main arena, we were met by a man on stilts along with a field perimeter of interesting stalls, exhibitions and events. Our spirits lifted. 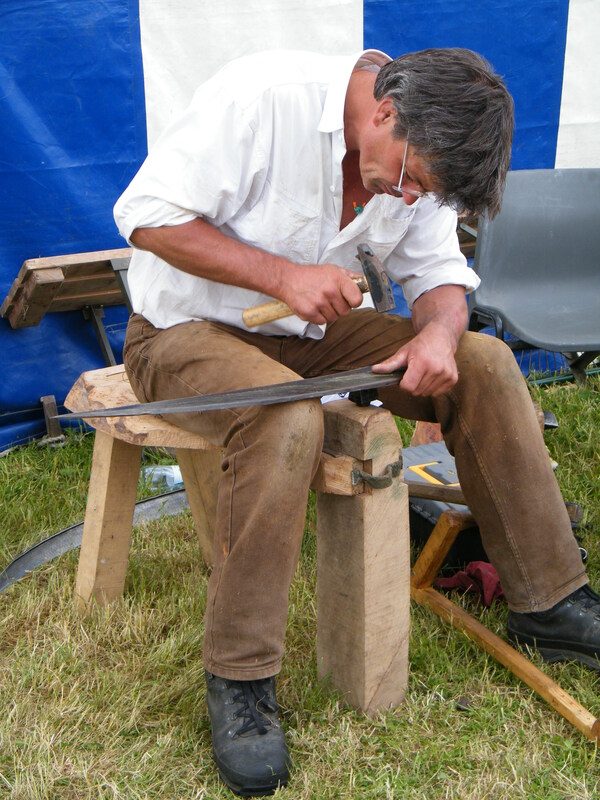 In the first tent you could try your hand at withy sculpting then further along were the wood craftsmen and women where you could watch a small spoon being made with an axe, or a rake for collecting your scythe cuttings (apparently Dorset wood is better for this because it is harder. I have to bow to his greater knowledge on that!). 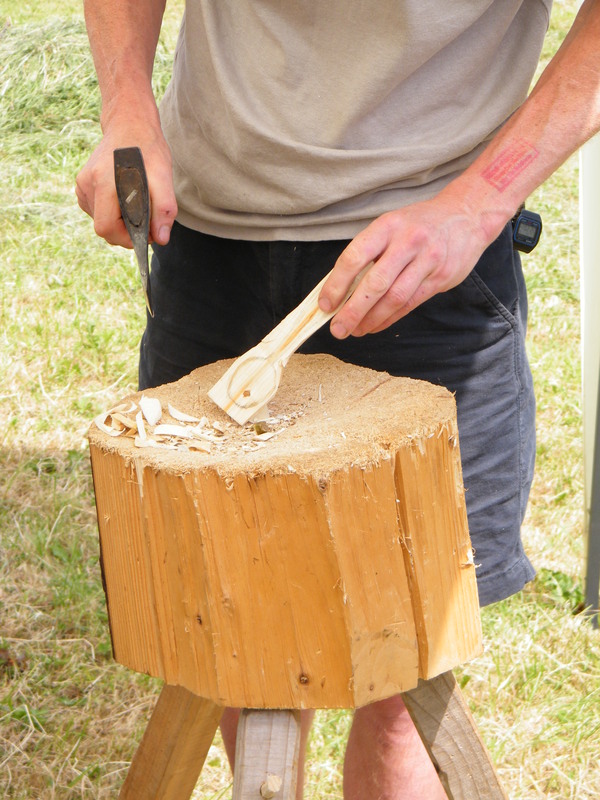 There were chairs of all shapes and sizes, bowls, utensils, jewellery and other paraphernalia, all made from wood. Further on were stalls selling the traditional blue/green sturdy ceramics. From small cream jugs to large fruit bowls and bread bins, there was everything you could possibly want for your country kitchen setting. The children were also taken into account (very wisely) with a number of ‘make your own’ stands, story teller and entertainer. There was a simply circus skills tent where you could hula hoop or throw a Diablo around. The food stalls were adequate albeit a little sparse, we rightly or wrongly hoped to see a hog roast or similar but had to make do with a meat filled bap. But wait, I hear you say, isn’t this meant to be a Scythe Fair well yes it was and the scythe cutting competition started in earnest at around 1.30 with a contest between a lady scyther (is that the correct terminology?) and a man wielding a petrol driven strimmer. Rather surprisingly it was a close call and whilst the strimmer won the battle, the war was far from over. 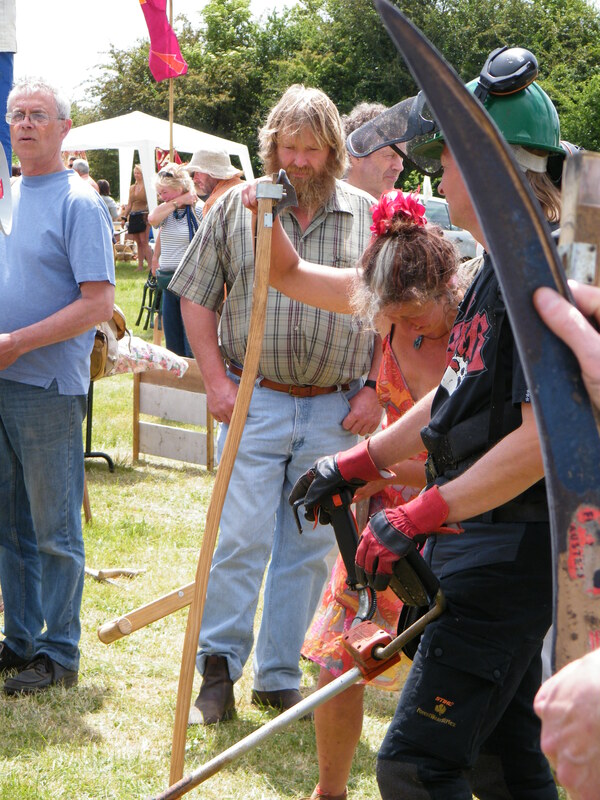 There were going to be several heats and the scythe sharpeners were being kept busy making the chine razor sharp by honing the blade with a whetstone. There were also several different styles of scythe; long and short snaiths; some with one grip, others with more; heels were being hammered and the toe shaped. It was serious scythe stuff. The competition moved around the arena so the scythers were faced with different challenges and the audience kept entertained. And that’s exactly what the Fair did; it really was highly entertaining to all. There was additional entertainment in the form of musical helpings from clog dancing to bands playing and if you get over there now, it will still be going strong, the bands are lined up to perform until well into the night. So after my initial cynicism I am glad to say it was well worth the trip and I look forward to next year’s event! 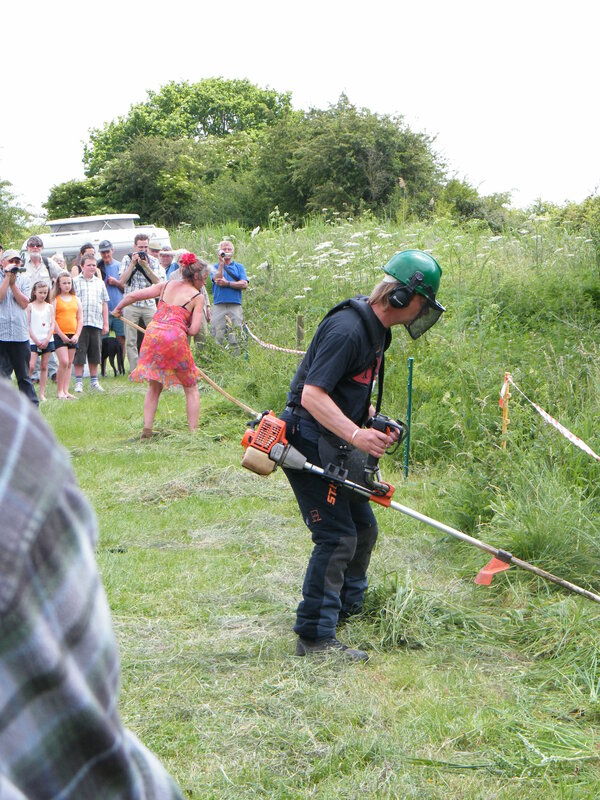 This entry was posted in Family Days Out and tagged eco, Festival, grass, green, scythe fair, somerset. Bookmark the permalink.